Although, Native American leader Tecumseh was not born near the Kankakee Marsh he had a great impact on its history. Written accounts state Tecumseh crossed at present day Baum’s Bridge during the course of his travels. Records of Tecumseh’s early life are a bit sketchy. 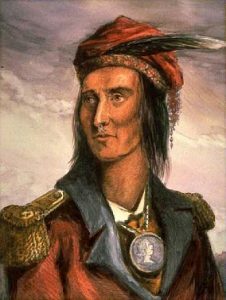 It is believed that Tecumseh was born in 1768 in or near Greene County, Ohio. Tecumseh’s father, Puckshinwau, was a minor Shawnee war chief. His mother, Methotaske, was also Shawnee. Tecumseh’s father, killed during Lord Dunmore’s War in 1774, had a profound and lasting effect on Tecumseh—pushing him to follow the warrior’s path, like his father. Tecumseh joined the Native American confederacy, led by Miami Chief Little Turtle, soon after the Revolutionary War. Little Turtle believed that tribes should cease fighting each other and unite as a group in order to stop American expansion. Little Turtle’s forces allied with the British during the Revolution and led many successful campaigns against American forces. Tecumseh first saw combat while conducting raids on river traffic down the Ohio River. These raids, for a time, severely curtailed settlers from reaching the newly added American Northwest Territories. Tecumseh’s first battle campaign was during the Northwest Indian War (1785–1795), also known as Little Turtle’s War, or as the Battle of the Wabash—which was actually a number of battles. It is believed that Tecumseh fought in most of the major battles of the war. In 1791 Tecumseh participated in the victory over American General Arthur St. Clair. The end of battle saw St. Clair’s 1000 man force reduced to less than 30 men left unscathed. The Battle of Fallen Timbers was a turning point for Native American resistance and for Tecumseh personally. By 1793 the fledgling United States realized a beefed up force should be sent to the Ohio country. President George Washington sent Revolutionary War hero General “Mad” Anthony Wayne to squelch Native American resistance. Wayne was to be provided with a force of 2000 veteran troops and an additional force of friendly Indian scouts. Chief Blue Jacket led the Native American force of nearly 1500, including Tecumseh. The battle took place at a spot where a recent storm had uprooted many old-growth trees. The battle was a quick sharp conflict. Wayne’s force overwhelmed and routed the Indian forces. The Native American force retreated to the British held Ft. Miami. The British commander refused to open the gates leaving the Indians to face the American bayonet. This defeat led to the Native Americans’ forced signing of the Treaty of Greenville in 1795. Native American resistance to American occupation declined after the Battle of Fallen Timbers—declined, but not ended. Chief Tecumseh would rise to the challenge of stopping further American expansion. After the Native American defeat at the Battle of Fallen Timbers in 1794 the Indian Western Confederacy that fought American expansion in the Midwest collapsed. A year later the remaining individual tribal Chiefs were forced to sign the Greenville Treaty. The British were forced to accept abandon their forts in the Northwest Territory. Tecumseh, along with 250 warriors, did not accept defeat and withdrew to regroup and build a new alliance. Meanwhile the victorious General “Mad” Anthony Wayne built a string of forts along the Maumee River. The Greenville Treaty established the boundary line dividing Native American territory and American settlers. Native Americans would receive payments in goods as incentive to honor the treaty line. Unfortunately, the white settlers did not honor restrictions placed on them. Conflict continued between the two peoples. Tecumseh settled with his band in Greenville, Ohio, where Tecumseh joined his brother Tenskwatawa . Tenskwatawa (commonly known as The Prophet) could be described as a radical spiritual leader. His predictions gained him notice and increased following. Struggling with transition and upheaval the Native Americans searched to push back the scourge of American settlement. They felt the need to purify and purge themselves of the addiction of the white culture. Indians were drawn to The Prophet’s revelations and visions. His successful prediction of a solar eclipse in 1806 greatly enhanced his popularity. There is little evidence that Tecumseh was involved with the advancement of The Prophet’s religious awaking, but found it useful in furthering his mission to remove the white presence from his homeland. In time The Prophet moved his people to Indiana and founded Prophetstown on the Wabash River. Tecumseh and Tenskwatawa consolidated their power, building their base to push back the American expansion. This was a two front battle: Tecumseh traveled extensively, recruiting other tribes to join their confederation and Tenskwatawa continued to expand Prophetstown and control the hearts and minds of their followers. Tecumseh cautioned not to attack the Americans until their own force was strong enough to secure victory. Alarmed by the growing force, General William Henry Harrison marched a force of 600 men to disperse the confederacy’s headquarters at Prophetstown. Tecumseh was away recruiting allies in the south. Tenskwatawa, encamped on the Tippecanoe River, could not resist attacking Harrison’s force and ordered his 500 warriors into battle. The Battle of Tippecanoe was a total defeat for the Native American forces. Tecumseh’s dream of a strong Indian nation that would stop white expansion was lost. Tecumseh later joined the British in Canada. He was killed at the Battle of Thames in 1813. This defeat eventually led to removal of Native Americans east of the Mississippi.